A carefully thought-out backyard landscape plan is an essential ingredient to ending up with a beautiful and enjoyable outdoor haven. As an added bonus, backyard landscaping is a great investment, increasing the value of your property while giving you additional pleasure in your living space! How do we make best of use of the outdoor real estate you have available? Are you the type of person that loves to work in your outdoor environment (a “green-thumb” person), or are you better off choosing a scape that doesn’t require much attention? Do you prefer a natural, more rustic setting, or more of a formal/traditional feel? Do you have small children that need play areas, and more importantly, are you addressing safety issues when children or pets are involved? Is there a natural slope or rise in your site that could dictate landscape design and be incorporated into the setting? Will grading, fencing, or terracing improve the area’s attractiveness and functionality? Are you trying to make this outdoor space more private, or publically showcase its beauty? Are you aiming to block the view to an adjacent eyesore? Is there an open public scene to incorporate into your “panorama” that will enhance your own design and create curb appeal? Are you a social person seeking to entertain having family and friends share your outside paradise? Or are you looking for inner peace and dreaming of a thought-provoking, quiet retreat? Realistically speaking, what kind of budget will you want to factor in your plan? Use this questionnaire as a springboard for thought. This may lead to more, or different questions particular to your distinct circumstances. Once you are confident that you’ve researched enough landscaping ideas to bring your vision to life, our talented team will go to work with you and realize your dream. Give Landscape Creations a call today. We are a Unilock® Authorized Contractor for the Chicagoland area. 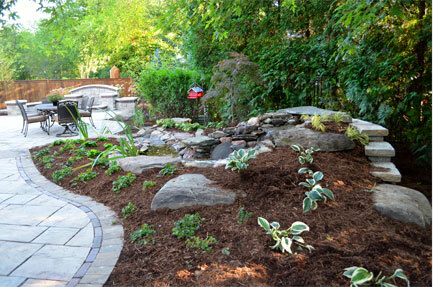 We can help you take your ideas and thoughts and put them into an actionable customized landscape design. We design and build walkways, patios, driveways, terraces, pool areas, and more. We can help with plant selection, provide resource videos and show you examples of what other homeowners have done. We’d be happy to provide an initial no-obligation consultation to discuss your landscaping ideas and needs, and get you started on building the outdoor environment of your dreams! Check out our awards and testimonials. 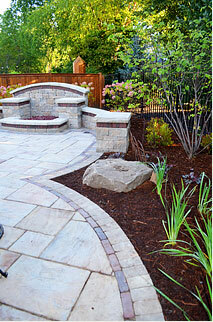 To begin your outdoor landscaping renovation, contact us at: (630) 932-8966.